n the space of just a few days at the start of this year, three of the world's top menswear brands—Brioni, Ermenegildo Zegna and Berluti—announced that their star designers would be leaving. But the industry showed itself to be resilient and innovative with its fresh hires while also welcoming into the market a major new player. As more and more big brands like Gucci and Burberry take a shine to the idea of showing both their womenswear and menswear collections together, the latter is being scrutinized like never before. Instead of standing alone, men's pieces now need to have a more homogenous aesthetic that falls in line with the womenswear designs. But major menswear designers find that this is the perfect time for their work to be under the microscope, because their clients are now much more comfortable with showing that they are knowledgeable about fashion and are not afraid to be seen as someone who keeps up with current trends. "They used to be ashamed of it. Nobody used to say that they actually buy and enjoy clothes," says Lanvin's menswear designer, Lucas Ossendrijver, about the societal shift in the market. Kris Van Assche, Dior Homme's creative director, agrees: "Men are really obliged now to take care of themselves, because the visual package is taken into account on all levels of life." As for the gender-neutral stance that some designers are taking, Brioni's new creative director, Justin O'Shea, has decided to swim against this sartorial stream. "In an era when many luxury menswear clothing brands are creating collections that are more and more feminine, Brioni has taken the opposite approach," he says. He also decided to show his first capsule collection for the house during haute couture in July, and used the band Metallica as the models for his debut advertising campaign for the company—two moves that bucked the current fashion trends both in terms of the official menswear calendar and the use of 50-somethings rockers instead of young "dandy" male models for print adverts. But headline-grabbing tactics are somewhat second nature to O'Shea, who, before his job at Brioni, worked for seven years as the fashion director of the luxury e-tailer mytheresa.com. He knows how to generate buzz and that is what big luxury brands are looking for in a saturated social media landscape. 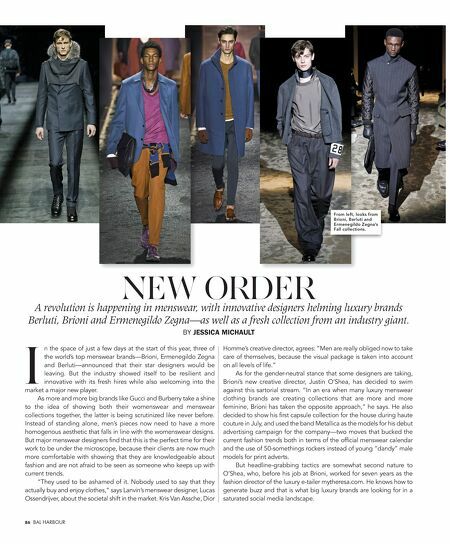 86 BAL HARBOUR NEW ORDER A revolution is happening in menswear, with innovative designers helming luxury brands Berluti, Brioni and Ermenegildo Zegna—as well as a fresh collection from an industry giant. BY JESSICA MICHAULT I From left, looks from Brioni, Berluti and Ermenegildo Zegna's Fall collections.